If you're looking to get my attention, putting my name on the cover of your magazine is certainly one way to do it. Yesterday I received the first two issues of THE JOURNAL OF INTERSTITIAL CINEMA, which its editors kindly sent to me, and I was pleasantly surprised to find my Millipede Press book about David Cronenberg's VIDEODROME the subject of an essay/review in the second issue. It's weird to see my own name and work sandwiched between "Great cheapskates of cinema! ", "The obituary of a playing card!" and "Necksnappers!," I suppose because nothing seems more mainstream to me than me, but that's the beauty of it. Published and written by (one assumes, the pseudonymous) Grog Ziklore and RJ Wheatpenny, JOIC celebrates the cinema that falls between the cracks not only of genre but of general notice. The first two issues strike me as an intriguing conglomeration of Steven R. Johnson's DELIRIOUS, Charles Kilgore's ECCO and Bill Landis' SLEAZOID EXPRESS. There's a tabloid element here ("Reel Tragedy," a look at an NYU film student's suicide, appears to be real reportage but reads like a comic item) but the writing is consistently intelligent. It's a pleasure to see people sidestepping the internet to inject some ink back into life and life back into ink. Very interesting viewpoint, and not at all untrue. Its inaccuracies, if any, stem from Wheatpenny knowing the public me rather than the personal me. My Facebook page, where I've spent most of my public time this past year or so, is a personal page though it welcomes most everyone who asks to be admitted. Music has always been a passion of mine, equal to if not greater than my love for films, which have been my vocation. My FB wall is a vehicle that lets me express my thoughts about music, for which I have no other outlet, and also to interact with a large number of people. And just as I once used all my free time between issues of VW to work on the Bava book, I'm now working toward establishing a career as a screenwriter, though I don't actually discuss those pursuits much on FB. Certainly, as RJ speculates, finishing the Bava book and publishing the Cronenberg book did something to formally close a big chapter of my life. From my own viewpoint, finishing the Bava book was like awaking from a nearly lifelong dream, wherein I had actually nourished the point of view that such a marginal obsession would be enough to hold and keep me for a lifetime. Many in my audience seem to think that completing these projects would simply free me up to tackle others -- a book about Jess Franco, for example. But not having these projects, especially the Bava book, to occupy me didn't have that effect; instead, I locked myself into this blog for awhile and continued to give and give and give, without taking anything in to nourish me. And I became aware that there were sides of life, of my own life, that I was not exploring and which were the only ways I could recapture the rush I felt when I was humming my way through a work in progress. So I made myself the work in progress. Swimming, vegetarianism -- I've told this story here before. Being a published novelist as well, I also determined to redirect my life toward achieving something more as an artist in my own right, rather than writing about other artists. Because spending my life alone at home in front of the computer 24/7 was no longer all I wanted from life, my writing turned to screenwriting. (It's my informed view that neither VW nor my fiction is likely to support me through my old age, so as I near my autumn years, income becomes more of a concern.) I've been seriously screenwriting now for four years; I've written seven different scripts, including multiple drafts of each, and I've optioned two. The people who have read my most recent feature script, an adaptation of Orson Bean's ME AND THE ORGONE, tell me it's the best thing I've ever done. I've yearned for more creative interaction, but I don't like spending long hours writing the best possible version of a story only to see it thoughtlessly fudged by other hands, so my thoughts have had to turn to directing. It's the only way for me to ensure that I'll finally be judged for what I've written, rather than for what was rewritten. I didn't think it was in my personal nature to be a director, but now that I have experienced what one gains by being surrounded by a supportive crew, I've learned otherwise. In a couple of weeks, I'll be returning to the Factory at the Douglas Education Center in Monessen, PA to direct my own first film work. The subject is an adaptation of my novel THROAT SPROCKETS, which could now be loglined as "MAD MEN meets TRUE BLOOD" though it was begun in 1987 and first published in 1994. When I met Guillermo del Toro at the Saturn Awards in 2008, he told me he considered THROAT SPROCKETS "the perfect MASTERS OF HORROR story." I'll be directing a promotional trailer and a representative dialogue scene from the book, which executive producer Robert Tinnell will then use to attract funding for the full feature, which we hope to shoot sometime next year. I'm not even going into everything I've gone through in the last couple of years, but even this much disclosure should show that I haven't lost my interest in movies -- on the contrary, that interest has expanded to encompass much more activity, and activity in the truest sense. Meanwhile, VIDEO WATCHDOG continues to come out on schedule, I wrote more than half the contents of our 20th Anniversary issue (#158), and I'm constantly brainstorming new directions the magazine might take to keep it vital and growing as the marketplace continues to undergo radical change. 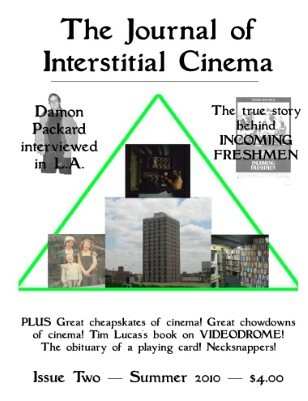 But I thank RJ Wheatpenny for the interest shown by his essay and I recommend those of you on the lookout for a new and unique fanzine to give THE JOURNAL OF INTERSTITIAL CINEMA a try. "We grudgingly have a website," its editors admit on the back cover. You can find it here while they remain on the technological fence, or beat the odds by sending US cash money ($3.00 for the 24-page #1, $4.00 for the 28-page #2) to Journal of IC, 387 Grand St. #902, New York NY 10002. An adaptation of THROAT SPROCKETS that you would be writing and directing intrigues me to no end. Good luck. Do you plan on keeping a daily or weekly journal, using WATCHBLOG, about the experience? That's a good question, but I'm not sure of the answer. I tried keeping a journal when I was on set last August during the filming of "The Baggage Claim," but the process turned out to be so personal for various reasons, and I was so occupied simply being in the moment, it wasn't possible. Afterwards, different people involved in the show were particular about what should and should not be shared, picture- and info-wise, and there was a lot for me to process personally, so it wasn't possible for me to write about that project in any public way. In fact, I don't know how anyone can write about a film's production from an inside perspective and be completely honest about it! I am still trying to come to terms with that week in my own personal journal! I don't expect to have any time during the TS shoot to diarize here, because my duties on that production will be multiplied, but I hope to file some kind of report here afterwards -- at least a teaser, with some images to tantalize you. Also, there are plans to activate throatsprockets.com, which I own, and spearhead some promotional ideas there that will stir up curiosity and hopefully go viral. Thanks for your interest!